When I think about my grandparents, I think about tea. I think about bubbling pots of rice and curry and that almost completely black — it was so burned — tea kettle punctuating the air with its scream. I think about Sundays, in rooms full of cloudy, yellow light walking over to steaming pots filled with Red Rose Orange Pekoe Black Tea. Black tea that Elsie Koop would fill with cream and lots of sugar. Black tea that John C. Koop would drink by the pot as he sat at the kitchen table either in pleated pants or his longyi, taking bites of dried chili pepper from their garden, while he added tiny notations in statistics journals. A cup of black tea is the perfect metaphor for my mixedness. It is at once so Asian and so British. It is something, as we know it now, rooted in colonialism. It is as much Downton Abbey as it is Yangon. Loaded with cream and sweetener it is so Burmese and yet something other, something in between. That something in between is what I am and what my grandparents were. 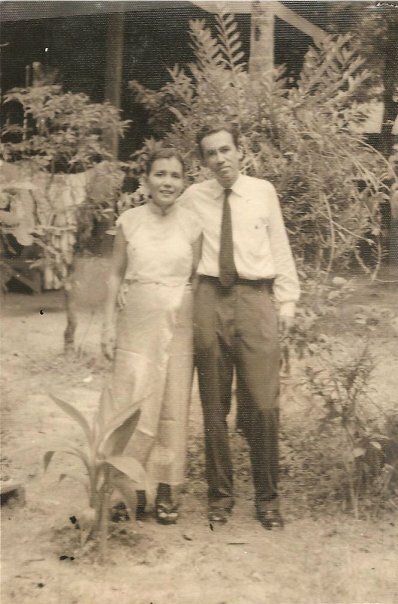 Both part white and Burmese, they were part of the “Eurasian” population in Burma, as my grandfather wrote in the studies Preliminary Survey of Social and Economic Conditions of Eurasian People in Rangoon and The Eurasian Population in Burma. That being said, I have never read these and I don’t even know where to begin to find them. What I know clearly, though, is that when Burma broke colonialist ties and the military junta took over, my grandparents and their children, who in their mixedness and social status represented colonialism, had to flee the country. Beyond all these little details, the few figures and pieces of jade they were able to take with them, what I do know is that when you went to Grandma’s house, you had tea. I drank tea with my grandparents every Sunday, at birthdays, after first communions, visiting in hospital rooms, and eventually, I held a cup of it in a styrofoam cup sitting in a room with my grandmother’s dead body, her mouth open, while we waited for my Aunt Helen to get back to us, her brothers and our cousins, all in the room at the resting home so we could begin to say goodbye to her body. We drank tea in their old house, now my Aunt Lizzie’s house, after Uncle Wilfred’s funeral, and talked about his manic, intense covers of Beatles songs. Over the years though, my relationship with tea has become different. 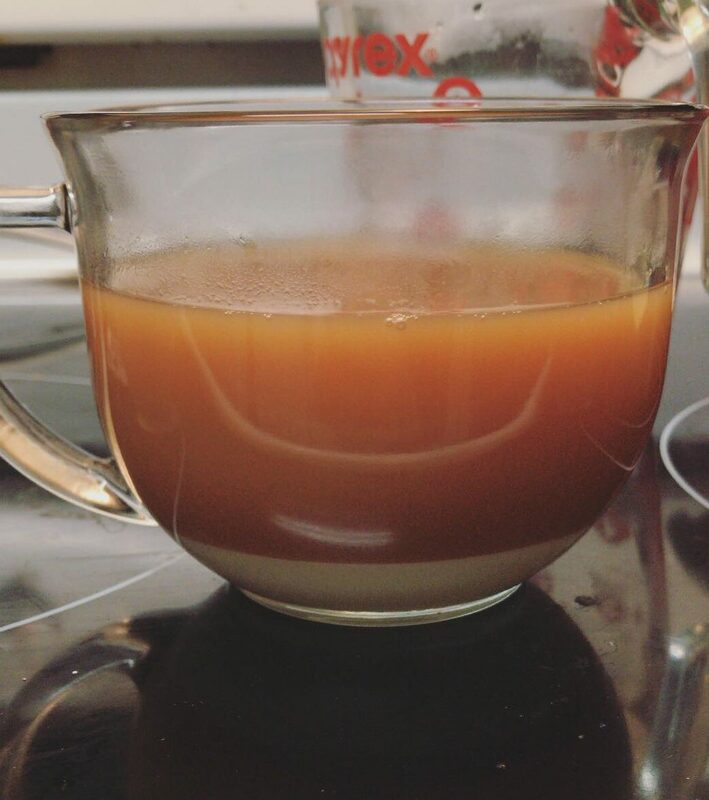 I started to add less sugar and milk. I started drinking green, peppermint, and rooibos without anything added at all. I stopped remembering to always scald the pot or the cup. I think, until recently, I stopped thinking about tea as something warm and good and joyful, but as a tool to make my work better. A thing to make me focus, something to heal my sore throat, to protect my voice, to get me through this next writing assignment. Until recently, I had forgotten what tea was to Elsie and John and all of the Koops. That the constant whistling of that pot wasn’t just something to drink, but something far away from what Raleigh, North Carolina could offer. 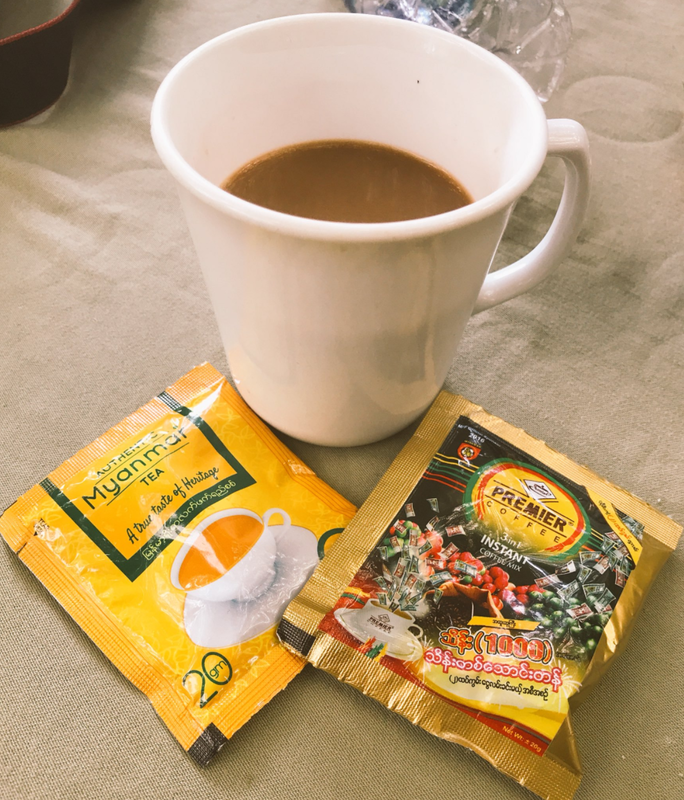 It wasn’t until my cousin Maria came back from a trip from Burma with her husband that I realized the sweet, creamy cups of black tea weren’t just my grandma’s sweet tooth — but that she was trying to replicate the milk teas you can get in tea shops in Myanmar. 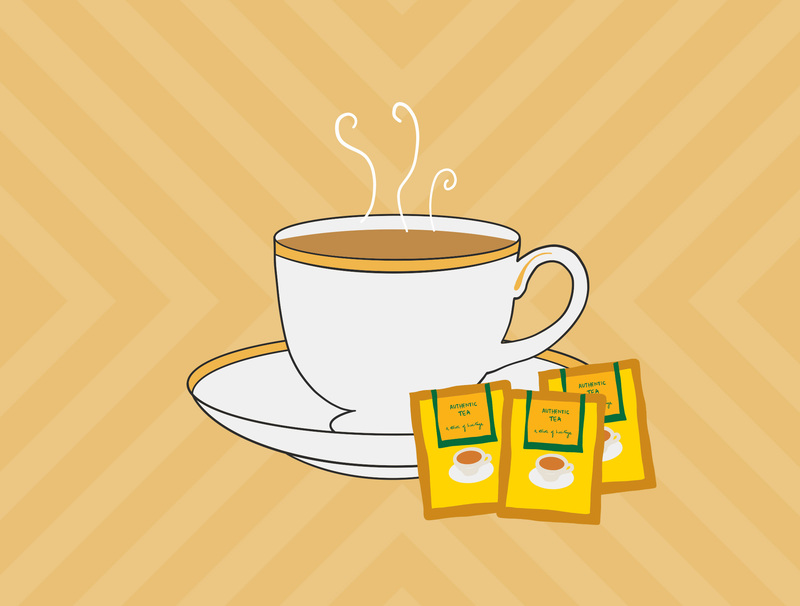 When I made that yellow Authentic Myanmar Tea packet Maria brought back and tasted it, there I was, back with my grandma drinking tea and eating shortbread cookies with strawberry jam. She had tried to make this with lots of milk and sugar, just as she struggled to make curries with what American grocery stores had to offer. Here I was, drinking a powdered version of it from a country she would never go back to. I knew this would never be like the real thing, so I started googling. Some even recommend steeping for 30 minutes, even using a rice cooker to get the correct amount of darkness. When I made it, I decided to try something inspired by my grandparents. When I took that first sip, it tasted like something richer and sweeter than I had tasted in a long time. Like jumping over wave after wave at the beach with my cousin; like playing a high-stakes game of sardines as the sun set under the giant tree in my grandparents’ backyard; like listening to the ragged manic rendition of “I’m gonna hold you hand” by Uncle Wilfred on his out-of-tune guitar; like my Aunt Rachel bringing out big pots of chicken korma; like the sweet, powdered kind of way Grandma smelled; like all of us cousins on her bed watching Avatar: The Last Airbender marathons; and like Grandpa gathering all the male cousins together as they stoked a roaring fire too hot for North Carolina summers. A cup of Myanmar tea tastes like something I may have forgotten or will never understand, but mostly it tastes like something different and comforting at once. The cup of tea I made is not like you would get from a tea shop in Yangon. It’s imperfect and mixed and maybe a little too rich, maybe a little too much. It seems like something too special to have every day, but at least it’s a connection to anything. When I think about my grandparents, I think about tea and how I wish I could share this one with them.